"We consume too much sugar." I think, if there is one health sentence to take away from last year, it would be this. We all have known high-fructose corn syrup has altered the way we consume foods. It's in everything. I was standing by the condensed soups and a woman pointed out Campbell's Health Request tomato soup had high fructose corn syrup in it. There was an outcry when bread was found with it. I have to confess that I find myself looking at labels way more closely now. I keep a bottle of Karo, which is high fructose corn syrup, on the shelf because it's needed in some desserts. Otherwise I like to steer clear of the stuff. Back in May, some of my RA blood work came back pre-diabetic. I'm not the best eater when I'm at home. I can buy salads and sandwiches and scrutinize menus down to their 6 point type, looking for things I don't want to eat when I'm out. But at home, my diet is a mess. In April, we were really busy and rather than fix myself a good breakfast, it was way easier to stop by Dunkin or Panera and pick up tea and pastries. Ease is not always good for one's glucose or waistline. Armed with this knowledge, I took a look at my diet. I limit myself to Dunkin' once every 10 days. If I have to be out the door early on consecutive days, I cut myself some slack. It is easier to grab Dunkin when I know I'll be on my feet for 4 hours. Panera is easier to limit because it's not on the way to the office. I have to make a special trip to get there. The next thing to investigate was the groceries in the house. I rarely bake anymore and I just don't have sweets in the house. But there was one thing I was consuming a lot of; soda. Every trip to the grocery resulted in a fridge pack or bottles or a case of Dr Pepper coming home with me. If anything is more corn syrup-laden than regular soda, I'd like to know what it is, aside from pecan pie but that's not something I'd eat every day. I realized I like the fizz. I could do without the taste. How could I get the fizz with none of the sugar. 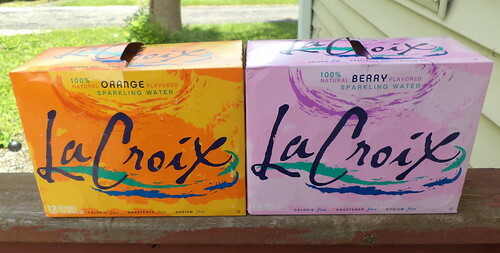 LaCroix is, by far, the largest producer of seltzer. They positioned themselves as the alternative to soda. I've tried almost all their flavors. I won't drink the grapefruit one. Can't stand grapefruit. I keep coming back to berry flavor. This is $5 for a dozen. I can get Dr Pepper on sale, which is pretty much 80% of the year, for $3.99. When you are pinching pennies, the temptation to buy soda because it's cheaper than water is real. Last year, I replaced soda from Memorial Day to Labor Day with LaCroix. The ONLY time I allowed myself soda was when I was working in the field and needed to get lunch. If I bought my lunch during the day and brought it back to the office, I drank tea or bottled water. I wound up losing 10 pounds over the summer. Most importantly, I went out of the pre-diabetic range on blood glucose. Now, I've tried to be better about eating fresh fruits and veggies. It can be really hard to motivate myself to cook when I come home from work. I just want to sit. Friends have said, "Use the weekend to make meals in bags and freeze them." That's all very nice and I appreciate the sentiment, but I don't want to spend a weekend cooking, even with the knowledge I'll have a grab'n'cook meal in the upcoming week. I buy with an eye toward needing, at most, 30 minutes to prepare something. If I cook some large item, like a pasta dish, I make sure there's extra and it's all sorted so all I have to do is grab a container and nuke the contents. I buy a lot of frozen meals for work; after reading the ingredient list, of course. But I'm sorry to say the vegetable drawers in the new fridge are just as effective at composting vegetables and fruits as the drawers in the old fridge were. I am just not realistic about what looks good on a Saturday morning versus what I will actually prepare and eat. Still, this is a huge step in a good direction. Over the holidays, I did bring more soda into the house than at any other time prior to May 1st. Canada Dry supposedly makes some very good flavored seltzers, but I've not seen them around these parts. I'd like to try them. When I went to Carole and Larry's over Thanksgiving, they usually get Dr Pepper for me. I asked them to get LaCroix instead. You'll still see Dr Pepper come up as the beverage I'm consuming as I write because I will get it when I go to Subway. It's cheaper to get the meal deal than just chips and a sandwich, at least around here. But, when the last of what I have in the fridge is gone. I'm not buying more, no matter how enticing the prices for soda are with the Stupor Bowl upcoming.